Hana Shalabi, a Palestinian Ghandi. Now and then Western media commentators lament: Where, oh where are the Palestinian Ghandis? Answer: In several decades of military occupation, thousands of Palestinian Ghandis have either been killed or imprisoned. Others are currently leading non-violent protests across occupied Palestine. Hana Shalabi is a Palestinian Ghandi, one of more than 300 Palestinians currently held under “administrative detention,” without trial or charge, and one of more than 5000 Palestinians currently imprisoned by Israel under other forms of military law. As Khader Adnan’s recent hunger strike did, Hana Shalabi’s resonates widely as a powerful act of resistance against the injustices of administrative detention, military law, and the occupation. Haggai Matar’s report follows below. Haggai is an Israeli journalist and political activist. In 2002, he was imprisoned for two years for refusing conscription into the Israeli army. His life before, during and since prison is documented in Our Way to Fight. “Palestinian administrative detainee Hana Shalabi is now on the 22nd day (March 8) of her hunger strike, to protest the torture, assault and degrading treatment to which she has been subjected and her ongoing detention without charge or trial. Three recent court rulings may mark a shift in the system’s attitude towards her, following the Khader Adnan case. Lawyers from the Palestinian prisoner rights group Addameer report that Shalabi’s physical condition is deteriorating. After more than three weeks of no food and very little water, Shalabi is beginning to experience pain in her chest and waist, suffers from nausea and dizziness, and is having a hard time talking without gasping for air. Hana Shalabi was released as part of the Gilad Schalit prisoner exchange between October and December 2011. She was re-arrested by the army on February 16 [MR: a growing number of Palestinians released in the exchange have been re-arrested], and has been held since in administrative detention. Military authorities claim she presents ‘a threat to regional security,’ but as usual they offer no evidence, no charges. Earlier in the week, the Military Court in Ofer, [MR: where Hana Shalabi is imprisoned], decided to shorten her detention from six to four months, a decision that Shalabi has decided to challenge at the Military Court of Appeals, where her case was heard on March 7. According to her attorneys, the judge asked the military prosecution to learn from the Adnan precedent and reach a deal with the defense. After more than sixty days of hunger strike, Adnan was guaranteed he would be released at the end of his current period of administrative detention, that it would not be extended further. Adnan then ended his hunger strike, and has been undergoing intensive medical treatment to help his body recuperate from the trauma caused by the long strike. 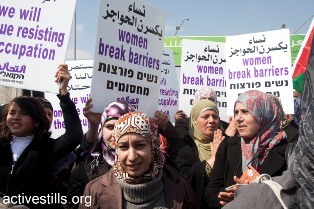 As to whether a deal will be struck in Shalabi’s case, the judge promised to give his ruling on the appeal by March 12. A second appeal made in Shalabi’s name was also heard yesterday at the Petah Tikva District Court, dealing with questions of medical attention for prisoners. Hana Shalabi is refusing to see Israel Prison Service doctors, and demands instead to be treated solely by doctors from Physicians for Human Rights – Israel. On 23 February, Hana’s mother, 65, and father, 67, began an open-ended hunger strike in solidarity with their daughter. Addameer activists stressed yesterday that in spite of some promising news from the court, Shalabi’s condition is still deteriorating, and said they call upon the international community to intervene and promote the immediate release of Shalabi and all other 300 administrative detainees.